Our famous Vancouver Party Bus Service has set the standard in luxury group transportation for over 20 years. Ritz delivers the finest fleet of luxury limousine buses and party buses without compromise. We listen closely to what our customers want use that information to evolve and improve our fleet to match those requests. Every aspect of our private party bus transportation is designed to make your event and night out a remarkable experience. This is why Ritz has become Vancouver’s best known and preferred limo party bus company. Our party bus fleet is exceptional. We offer only Vancouver’s finest selection of beautifully maintained vehicles. Our large fleet consists of limo buses, party buses, shuttles, executive vans and motor coaches. This huge selection ensures we have the perfect private bus for every group size. Our smallest party bus is ideal for 16-18 passengers. Our largest party bus suits groups of up to 40 passengers. With pricing starting at under $200/hour our Vancouver party bus rates are the lowest in the city. Please note that our low prices do not diminished the level of service we deliver. We utilize only the best quality buses. Our party buses are meticulously maintained. Every party bus service is preformed by a professional driver. We will never compromise on our high quality service because we want to earn your repeat business. We shop our competitors’ rates to ensure we are always delivering the best pricing, packages and party bus features and services. This is why Ritz is Vancouver’s preferred party bus operator. Our Vancouver party buses feature passenger cabins that are the definition of luxury. Frequent updates and new modern buses make sure that we offer the finest in party bus transportation. Comfortable leather lounge style leather seating, entertainment features, bar service areas, ice storage, LED flatscreen TVs, tinted windows, hardwood floors, laser lights and mood lighting, privacy dividers and custom stereo systems with sub woofers and luxury interior finishings make Ritz party buses Vancouver’s finest fleet. All of these music, privacy, lighting and climate control features can be accessed from the passenger cabin giving you complete control over your party bus experience. Cleanliness makes a big difference! Every Ritz bus is meticulously maintained and cleaned to offer all of our guests an unmatched party bus experience. Many party bus operators in Vancouver serve sub-par buses that are simply not well maintained or clean. Don’t let this be your experience. Choose Ritz and you will never go back to second best. High occupancy party bus transportation presents an affordable and efficient way to travel to and from any destination, party, event or concert. We can pick-up and deliver guests from their residences directly to the front door of any venue. With party bus service from Ritz you never have to worry about finding and paying for parking, walking long distances to events in bad weather, dealing with a designated driver situation. This way everybody gets to party! For group transportation to Vancouver International Airport, Seattle International Airport, Bellingham or Abbotsford Airport our airport limo bus service is an easy and affordable option. With seating for up to 30 passengers and lots of luggage capacity a limo bus is perfectly suited for airport transportation. Ritz offers airport party bus transportation to anywhere in the Metro Vancouver, Fraser Valley, Whistler region. We also provide airport bus transportation between Settle and Vancouver. An airport shuttle can seat up to 40 passengers. Shuttles also offer comfortable forward facing seating. Forward facing seats are generally regarded as the most comfortable way to travel for long journeys. Our airport shuttle service is popular with executive teams, sports teams, and large families attending weddings in the GVRD. Our Vancouver shuttles have lots a luggage and equipment storage capacity. Airport shuttles can be booked for one way and round trip airport transportation to all of the regions various airports. For the long journey between Whistler BC and Vancouver our limo bus and shuttle service is the only way to go. We have mini bus options for small groups of 16-20 passengers. Our fleet of Whistler ready limo buses and shuttles can handle up to 40 passengers. Our Whistler bus and shuttle services runs everyday 24/7. They are popular options for executives, sports teams, golf tours, sightseeing groups and large families to acquire affordable one-way and round trip transportation between Whistler and Metro Vancouver. We like to refer to our wedding party buses as “limo buses” because they are simply maintained and cleaned to a high standard than what most other party bus companies offer. For over 20 years Ritz has specialized in delivering uncompromising wedding limo bus services for weddings throughout the Metro Vancouver region. We have white and black wedding limo buses to choose from. Our wedding bus fleet comes with a standard wedding decoration package, but we can customize the look and style of our fleet to work with your wedding day theme (extra charges may apply). Our wedding buses are an ideal option to get your wedding party, special guests and family from wedding ceremony to reception and then back home at the end of the night. We take all the stress out of your wedding day transportation plans and free up your guests to fully enjoy themselves free from the worry of transportation constraints. Our party bus services is also a favourite for Vancouver stag and bachelorette party transportation and big engagement parties. What could be better than celebrating grad with all your friends in a luxury limo bus? We provide Vancouver city’s favourite graduation day group transportation services. We have many different sizes of party buses to choose from. This means you pay for only what you use. This helps keeps costs as low as possible. We also offer special party bus discounts to all of our grad clients. Just make sure you tell us your booking is for a graduation event. If you are interested in booking one of our party buses or renting our other private shuttles or motor coaches please feel free to call us during office hours or email anytime. Our booking office hours are from 8:00am – 6:00pm, Monday – Sunday. Ritz service representatives are standing by and always happy to answer questions about our party bus services or information to help you plan a perfect corporate event, wedding or stag party limo bus transportation experience. 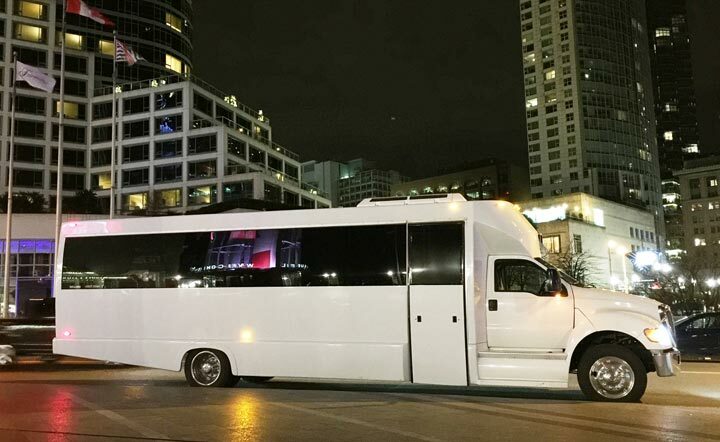 Remember that you get what you pay for when renting Party Bus services in Vancouver. Ritz owns and operates all our vehicles so we can guarantee you will receive the best customer experience possible. Many limo operators lease other company’s limos and have very little experience. Ritz also maintains our fleet is of the highest standards of quality, we are fully insured and we are constantly upgrading and replacing our fleet with the newest most sought after vehicles.